I’ve been eating a lot of salads lately. Maybe it’s from having April in February, or maybe it’s because i have access to lettuce with actual flavor. I get mine from a CSA. 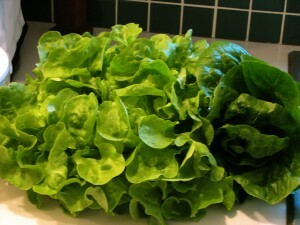 This photo shows the latest load of leafies: a ruffled type of lettuce called panisse and some romaine. I even snack on the leaves on their own, chomping like a large rabbit. But I never knew that innocent salads were a threat. I discovered that a friend, let’s call her “Molly,” hates salads and all that go into them: carrots, tomatoes, cucumbers, radishes, even lettuce. “How can you hate lettuce?” I asked. “It’s like eating green, crunchy air.” She just does. “It’s a texture thing,” she said. She also picks lettuce and tomatoes off of sandwiches. “Molly” contends that she does like vegetables: peas, corn and potatoes. And broccoli, but only the stalks. She also hates celery. “Celery? How can you hate celery?” said another friend sitting nearby. “Celery doesn’t have any flavor. Unless you dip it in hot sauce. Have you ever tried that?” “Molly” made what my father would have called a “cow eating briars” face (except that she doesn’t graze on green things). She held the face and shook her head as Friend 2 and I discussed whether we could get celery stalks to soak hot sauce up into their fibers, then use them in bloody marys. This I will try. But I won’t make “Molly” watch. Hey, y’all, did you know that if you eat baked goods for a good cause, they have no calories? I’m a food professional. I know these things. That’s why you should come by the second Triangle Food Blogger Bake Sale on April 28, 10 a.m. to noon. Stay tuned for the location. Last year’s was near the Durham Farmers Market – and we raised $650 for Share Our Strength‘s efforts to fight childhood hunger. The group will benefit this year as well. If you want to participate, get out your best recipes (I’m thinking about something with blueberries this year) and visit here to sign up. Once again, North Carolina is well represented in the semifinalists for the James Beard Awards, which were just announced. Magnolia Grill in Durham was nominated for Outstanding Restaurant. Ashley Christensen of Poole’s Diner in Raleigh was nominated for Best Chef Southeast, as was Scott Howell of Nana’s in Durham and Aaron Vandemark of Panciuto in Hillsborough. Other North Carolina nominees in that category were John Fleer of Canyon Kitchen at Lonesome Valley in Cashiers and Vivian Howard of Chef & the Farmer in Kinston. The nomination is a vote of confidence for Howard as she works to reopen the restaurant after a fire a few weeks ago. Sean Lilly Wilson of Fullsteam Brewery in Durham was nominated in the Outstanding Wine and Spirits Professional category. Katie Button of Curate in Asheville was nominated in the Rising Star Chef category for new chefs. Five finalists will be selected in each category on March 19, and the winners will be announced at a gala in New York on May 7. Back in December, when I pulled out the six jars of damson plum jelly I made in August, all ready to fill Christmas goodie baskets, I got a most unpleasant surprise. None of them had set. 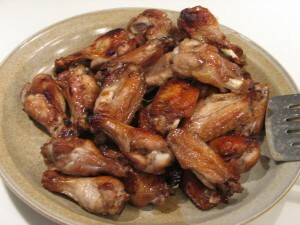 It was too late to do anything about it, and re-cooking usually spoils the flavor. The jars had sealed properly, so I relabeled it as pancake syrup, a role it fills quite well. That still left me tragically short on jelly, especially after I had to dip into my private reserve to fill my friends’ holiday demands. While it has been a mild winter here, it hasn’t been mild enough to make plums or berries bear this early. I was faced with the offerings of the supermarket freezer. Then, I had an idea. I made juice for jelly from frozen blackberries, then combined it with Earl Grey tea. The result was a deep, dark jelly. The subtle citrus flavor of the tea meshes perfectly with the berries (and hides the fact that they aren’t ultra-fresh berries). Place berries and 1/2 cup water in a saucepan. Bring to a boil over medium-high heat, stirring frequently. Reduce the heat to a simmer, cover the pot loosely and boil for 5 to 10 minutes, until the berries are softened. Crush them occasionally with a potato masher. Pour the berry mixture into a strainer lined with dampened cheesecloth (or use a jelly bag, if you have one) set over a deep bowl. Let the juice drip out for about 2 hours. You should end up with 2 cups of juice. While the juice drips, bring 2 cups water to a boil. Place the tea bags in a bowl. Pour the water over the tea and let steep for 15 minutes. Remove the tea bags. Place the juice, tea and sugar in a large stainless-steel saucepan and bring to a boil over high heat, stirring constantly. When the sugar is dissolved and a full rolling boil has been reached, stir in the pectin. Boil hard, stirring constantly, for a few minutes, until the jelly tests done. Pour it into sterilized half-pint jars, hand-tighten the sterilized lids and process in a boiling water bath canner for 10 minutes. Then remove the lid, turn off the heat and let the canner sit for 5 minutes. Remove the jars and let cool before storing.